For the second year in a row, Orangeville Council has refused to add “much needed” full-time firefighting support to its ranks, going against the recommendations of Fire Chief Ron Morden. While the town is currently covered from 6 a.m. to 6 p.m. by 12 full-time firefighters, it relies on 36 volunteer firefighters between 6 p.m. and 6 a.m. While he commended the commitmentx of his volunteers, Chief Morden said the Town has to consider adding eight new full-time positions to improve response times during the evening and overnight hours. On average, response times during the evening/overnight stretch close to the 13-minute mark in Orangeville – almost eight minutes more than the daytime average. The difference, according to Chief Morden, is that full-time firefighters are responding directly from the station during the day, while volunteer firefighters are often responding from their home, so it takes time for them to get ready and make their way to the station. “This is nothing against the skill level of our volunteers, they are trained to the same standards as our full-time firefighters and they do an incredible job,” Chief Morden said. Emergency response times recognized in the industry are set by the National Fire Protection Association and the Ontario Fire Marshal’s Office. The standards state that firefighters should be assembled on the fire ground in a coordinated, rapid and consistent manner, with the first responders (a four-person team) assembled within five minutes of the initial 911 call and a full response of 10-15 firefighters in place within 10 minutes. The addition of eight new firefighters would set the Town back $800,000 in 2018, and a projected $1.15 million by 2022. 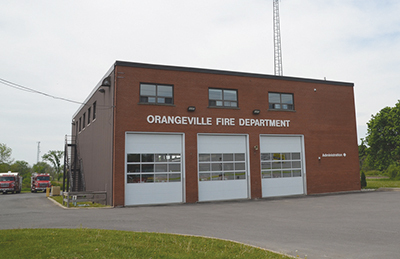 Orangeville’s budget for Fire Services next year is around $3.2 million. That would have gone to over $4 million had Council granted the request. “I feel strongly that we need to protect our town,” Coun. Campbell said. While recognizing that Council did have a responsibility to providing a timely and effective service to the community, Coun. Nick Garisto said he feels he has a responsibility to taxpayers, stating he could not support something he believes would place a considerable burden on residents. In total, Town Treasurer Marc Villeneuve said the additional $800,000 required for the eight full-time firefighters would lead to an additional 2.4 percent increase in the 2018 operating budget, which was already posting a 2.6 percent increase from 2017. With taxes in Orangeville already amongst the highest in Ontario, Coun. Kidd said he could not support tagging an extra 5 percent onto that load. “This is a tough one, we all like firefighters, we all want to make sure our community is as safe as it can be, but 5 percent would be a big increase, and that’s without even touching our capital budget,” Coun. Kidd said. Coun. Sylvia Bradley called this “one of the most important decisions during the current term of Council.” In an apparent last-gasp attempt to garner enough support from Council to get a motion over the line, Ms. Bradley stated she would not want to have this decision on her conscience in the future should something go wrong. Going one step further, Coun. Scott Wilson said he would be ashamed of Council if they did not support Chief Morden in his attempts to improve Orangeville’s fire services. “For me, it’s comical almost that the Chief is offering to reduce call times for an emergency department and we are saying we cannot afford it. You may recall when we were discussing the future of policing in Orangeville that response times were of great concern to everybody… I don’t see how we can now ignore response times when we’re talking about fire,” Coun. Wilson said. The big difference in this case, said Mayor Jeremy Williams, is the public. He says he’s heard “almost nothing” from local residents about the need to improve fire services in town and believes this is an expense that the municipality can hold off on for another year at least. In the end, Mayor Williams, Deputy Mayor Warren Maycock and councillors Garisto and Kidd decided against supporting the request. Councillors Campbell, Wilson and Bradley voted in favour.